Since 2014 Jean has led HRI’s evaluation program, working closely with administrators and clinicians at Homewood Health (HRI’s primary practice partner) to identify evaluation needs and priorities. 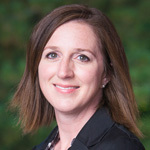 Currently, her primary responsibility is leading the development and implementation of an outcome-monitoring system (known as the Recovery Journey Project) designed to routinely collect, evaluate and report on recovery-oriented outcomes among patients who have received treatment for addiction and/ or mental health. Jean obtained her PhD from the School of Public Health & Health Systems at the University of Waterloo, where she is now an adjunct faculty member. Her graduate training focused heavily on program evaluation (i.e., approaches, designs, and methods) and included advanced knowledge and practice in developing logic models. Her academic work to date has focused on the area of addiction with a particular interest in tobacco use and cessation. As a graduate student, Jean received several academic awards including a CIHR Banting and Best Canada Graduate Scholarship 2010-2013. Prior to pursuing her PhD, Jean worked as a Research and Evaluation Co-coordinator at the Centre for Addiction and Mental Health where she played a lead role in implementing and evaluating a province-wide smoking cessation intervention. Jean is also a member of the Canadian Evaluation Society.